Boys aren't the only ones into cars. I had Matchbox cars when I was a kid (and had to constantly keep an eye on my male cousins! ), all very ironic as I don't drive but I do appreciate muscle cars! The next best thing to driving fast cars is watching them race right? 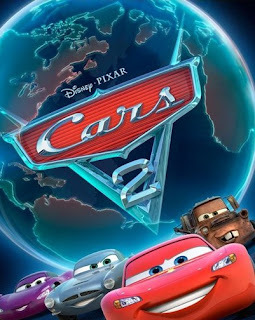 Cars 2 focuses in more on the friendship between McQueen and Tow Truck Mater with a mix of international espionage thrown in for fun. The kids will love Mater's goofy charm and Pixar's fantastic animation that will take them around the world (without the expense of airfare) and teach them a thing or two about friendship in the process. I am happy when they layer a kid's film with humor and other stuff the adults can also enjoy.